Beading Arts: Celebrating wire on Beading Arts! Do you love working with wire or does it frustrate you? Wire has never been my primary material, although I love the look of it...especially when someone who really knows what they're doing uses it! But even a fumble-fingers like me can put together a couple of fun projects that incorporate wire in different ways, and that's what this month is going to be all about. During this month, I'm going to share some new projects with you, a round-up of information that's in our archives here on Beading Arts, and point you to the fabulous work done by artists we already know. I also want to share new artists and have all of you who love working with wire to join in too. 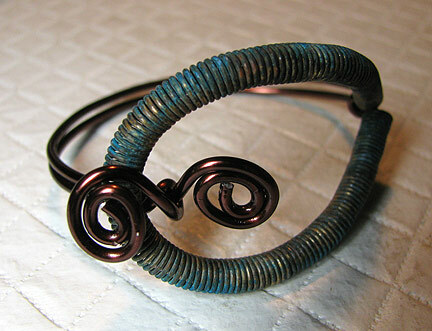 Whatever you do with wire, especially if you combine it with beads, we want to see your work. You don't have to be a pro...you just gotta tell us why you love wire! Please send your artist statement of one to two paragraphs, and up to three images (72dpi res) of your work, along with a link to your site to cyndi @ mazeltovjewelry.com (remove the spaces). And please put "wire artist" in the subject line. We wanna see your work! Gorgeous bracelet - love the patina on it!